The following is an excerpt from Places of the Heart, by Colin Ellard. My office neighbor at the University of Waterloo is Dr. Mike Dixon. Mike is a tall, gentle, soft-spoken man with a long pedigree in research that includes work with patients who suffer visual problems after brain damage, and the remarkable phenomenon of synesthesia, in which one sees peculiar combinations of sensory properties, such as numbers that appear as colorful objects. Dixon has made groundbreaking discoveries in both of these areas; however, recently he has turned his attention to problem gambling. Visitors to casinos, or those who play at video terminals in bars, are looking for the cheap thrill that comes from the sounds and lights of a machine offering the unlikely possibility of a cash payoff. These machines are remarkably effective at removing cash from the pockets of their users to the extent that some people have become so addicted to the thrill that they have lost their possessions, their marriages, and sometimes even their lives as they spiral into suicidal despair at their inability to control their impulses. Indeed, the incidence of suicide in problem gamblers outstrips by a considerable margin the rates of suicide for all other forms of addiction. Dixon has studied several aspects of such problem gambling using generally the kinds of tools that I’ve been describing that allow one to monitor the activity of brain and body. Participants in his experiments are wired for measurement of skin conductance, gaze, and heart rate and they are presented with different kinds of gambling scenarios using genuine electronic slot machines. A visit to his laboratory immerses one in a crazy environment of sights and sounds reminiscent of a real casino—his experiments are the most popular in the department among our volunteer pool of psychology students. Much of Dixon’s work has focused on the well-used casino tactic of the “loss disguised as a win.” The electronic machines are programmed in such a way as to present to the gambler the illusion that they have won a payoff even though over a slightly longer term, they are actually losing money. Dixon has shown that these near-wins cause heart rates and skin conductance values to spike, bathing the gambler’s brain in an irresistible soup of reinforcing chemicals, and egging them on to spend even more money. The sum total of my own experience with casinos came during a visit to Las Vegas several years ago with my brother. I sat before a slot machine, feeding it dollar bills and trying to make sense of the flashing displays and tinkling tunes indicating where I stood. After about a dozen tries, the machine told me that I had “won” a substantial amount, but it translated my winnings into a display showing how many gambling chips I had at my disposal. My immediate reaction was to settle back into my chair, happy that I had the chips to play the machine about forty more times. My brother, walking up behind me and watching me for a second, interrupted me. “What are you doing?” he asked. “You’ve won!” “I know!” I replied, “it’s great, isn’t it? I have lots more plays now.” “You do realize that if you stop now and cash out you’ll have about $200?” he responded. The thought had never crossed my mind that it was possible to convert the abstract numbers on the machine into real dollars and to walk away. Without my brother’s intervention, I’m sure I would have sat at the machine until my $200 had been reabsorbed into the casino’s coffers (in full disclosure, I should also mention that my brother is a professional accountant!). I left the machine, converted my chips to real money, and walked out of the casino. I haven’t been back since. This Las Vegas casino’s ability to lift cash from my pocket by creating an air of unreality, detaching me from the realities of dollars and cents (or perhaps sense) is a tiny example of the larger game that is at play in such places of lust, which extends far beyond the mechanisms and programming of odds tables in slot machines and reaches into every corner of the design of the rooms and buildings of places of gambling. In Dixon’s work, the emphasis is on the operation of the single gambling machine and how it influences behavior, but there is a long history of research in environmental design of casinos. Those who are in the business of building better gambling halls have conducted some of this work, whereas other investigators like Dixon focus on managing problem gambling behavior. Understandably, researchers of the latter kind who attempt to gain entry to operational casinos are treated with circumspection. Casino owners are reluctant to reveal all of the secrets by which they stack the odds against their clientele. Indeed, one Canadian researcher who was awarded a substantial grant from a government agency charged with helping to understand problem gambling was denied entry to Canadian casinos to conduct her studies and had to resort to standing outside the establishments, hoping to catch and interview patrons as they left the building. The advent of electronic gambling terminals like the ones studied by Dixon has produced an important change in casino design. Slot machines—once mostly considered to be amusement for casino “outsiders”: women, the poverty-stricken, and the casino newbies—were placed around the edges of the casino, well outside the zones of gaming tables like roulette and blackjack where the serious money was to be won or, more likely, lost. These sophisticated machines have now become the centerpiece of the casino and its chief earning technology. But the design work of the casino begins by considering stages in the user experience that start long before the gambler actually takes a seat in a chair in front of a display. Decades of research in architectural design for casinos, some of it conducted by traditional designers and architects, but much carried out by veterans of the casino business and based on years of careful observation and experience, have prescribed several important principles that can lead a player to a machine. Human beings have a deep affinity for curves. We are attracted to visual displays that contain gently undulating curves and we are repelled (and perhaps even a little frightened) of displays showing sharp edges. Such preferences, written into our DNA and predating our earliest experiences, also extend to the kinds of feelings that we experience during our own movements from one place to another. We much prefer taking a sweeping, curved route into a building or a room rather than a straight-line approach, especially if the straight approach requires us to make a hard turn from one direction to another. Although it isn’t completely clear where such preferences come from, it’s remarkable that we humans seem not to be the only animals that are affected emotionally by the shapes of our walking paths. Temple Grandin is a noted author and animal behaviorist who also happens to have autism. She has said that her own mental states have given her privileged access to the mental states of certain other animals, including domesticated animals used in agriculture. Grandin has argued both in her popular accounts and in her research that animals being led to slaughter in abattoirs are much less stressed when they follow curved paths rather than straight routes. Her findings have led to widespread changes in the design of U.S. slaughterhouses meant to address certain animal welfare concerns about the emotional states of agricultural animals. In this case, Grandin argues that the tactic is effective because it helps to shield the animals from the view of what is ahead for them. The comparison to the gambler wandering into a casino may be apt. The great guru of casino design is a man named Bill Friedman. Friedman, a reformed problem gambler himself, spent decades conducting careful observational studies of effective casino design culminating in a bible of sorts with the imposing title Designing Casinos to Dominate the Competition. In his book, Friedman describes the power of the curved entryway, but also prescribes other important physical elements that he predicts will increase the cash yield of a casino. For one thing, he urges that casinos take advantage of a property called “mystery,” long known by environmental psychologists to increase the appeal of a scene or place. Formally, mystery is defined as the likelihood that further investigation of a scene will yield new information. The classic example of mystery is the appearance of a winding forest trail, which leads the viewer further into the scene by promising that new vistas lie just around the next corner. Although far from the bucolic pleasure of a country walk, Friedman argues that the same kind of physical arrangement of spaces in a casino—a set of partially occluded scenes that invite the viewer inward—can exert the same magnetic pull on casino patrons, which in this case will increase the likelihood that they will soon be sitting in front of a screen thrusting money into a slot. Indeed, many of Friedman’s recommendations, though he arrived at them through personal experience and careful observation of casino-goers, resonate with what is known of general human preferences for particular kinds of environments that are believed to have ancient and innate origins. Our preferences for places that are high in both prospect and in refuge likely had their origins in the advantages of selecting habitats that provided protection from predators and invaders, while affording the possibility of surveying our surrounding environment. Invoking much the same principle, Friedman says that gamblers at a slot machine will be more likely to take a position in a smaller alcove that offers some visual shelter from the larger space of the casino, but that does not completely cut them off from their surroundings. Evidence of the use of this principle can be found in abundance in casinos in Las Vegas, as well as in other places. Banks of gambling machines are much more likely to be found in small clusters that surround a small region of space than in the center of a large, cavernous space. In much of Friedman’s work, one of his main recommendations is that casinos be designed in such a way as to maximize the amount of time that a gambler spends focusing attention on the machines themselves rather than the larger environment. In his view, attention paid to the walls, floors, or ceilings of a casino represents wasted potential profit. However, recently a new kind of design philosophy has begun to take hold in some casinos. These so-called playground casinos are designed explicitly to make us feel good by presenting us with appealing sights and sounds, often in the guise of large-scale simulations of notable world landmarks. One can view a Venetian canal, sit in a French sidewalk café, or gaze upon a large expanse of forested greenery, all while on the way to the slots or sometimes even while play is under way. The design philosophy of the playground casino is that environmental interventions that increase positive emotions will encourage us to remain within the casino space for longer and to return to the casino more frequently. In addition, the large spaces, symmetry, muted color schemes, and presence of natural elements within the casino will produce the same kind of restoration from the taxing cognitive demands of game play that a city park might produce for a stressed-out urbanite. Experimental evidence from studies undertaken in simulations of casinos support these ideas. Design elements that are common in playground casinos do, in fact, produce feelings of pleasure and restoration, and participants immersed in such simulations report that they would be more likely to spend longer times in such settings. In general, the most potent combinations of design features in a casino are large-scale elements that support pleasure and restoration along with so-called microdesign elements (flashing lights, packing together of machines with different kinds of appearances) that increase the availability of information in a particular location. Interestingly, there are significant gender differences in the ways that these different kinds of design elements interact to promote problem gambling. Women, for instance, are more likely to gamble longer in settings that are less crowded, perhaps because they feel less observed in such settings. Men, on the other hand, show gambling intentions that are more or less unaffected by the crowdedness of a setting. Collectively, studies of gambling behavior in simulated settings suggest that the environment in which gaming takes place exerts a strong but subtly nuanced influence on our emotional state and that such influences are very likely to translate into increased profit margins for casinos. In contrast to Friedman’s blunt-instrument approach, in which gamblers are treated somewhat like starving laboratory rats manically pressing a bar for reward, the more modern playground approach takes full advantage of what is known about the environmental psychology of pleasurable feelings. Any feelings of reticence that a gambler in a casino may feel about shelling out the next mortgage payment on a few more rounds of play can be attacked on many psychological fronts. Excerpted from Places of the Heart: The Psychogeography of Everyday Life © 2015 by Colin Ellard. Published by Bellevue Literary Press. 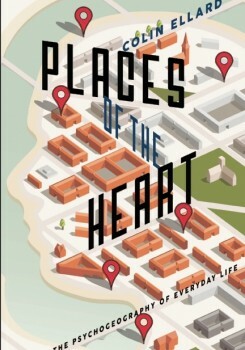 Colin Ellard is a cognitive neuroscientist, the author of Places of the Heart: The Psychogeography of Everyday Life (Bellevue Literary Press, 2015), and the director of the Urban Realities Laboratory at the University of Waterloo in Waterloo, Canada.